Summary of Main Themes and Insights from a Policy Conference Held on June 11-13, 2006 in Montebello QC. An Electronic Health Record (EHR) is a secure and private lifetime record of an individual’s key health history and care. It creates significant value, providing a longitudinal view of clinical information. The record is available electronically to authorized health care providers and the individual anywhere and anytime in the support of care. This record is designed to facilitate the sharing of data – across the continuum of care, across healthcare delivery organizations and across geographical areas. Healthcare is the world’s most information intensive industry. Every day this industry produces massive volumes of data, which, properly used, can improve clinical practice and outcomes, guide planning and resource allocation, and enhance accountability. Electronic health information is fundamental to better health care. There will be no quantum leap forward in health care quality and efficiency without high quality, user-friendly health information compiled and delivered electronically. The eHealth revolution is also the key to enhanced protection of privacy. Only in an electronic world is it possible to ensure that identifiable patient records are accessible to providers on a need-to-know basis. Access to all or parts of an EHR can be protected, and the identities of those who have looked at an EHR are known. Such protection is impossible with paper records, particularly in hospitals and other institutions. Building a first-rate health information system may have as great an effect on 21st century health care as Medicare did in the 1960s and 1970s. But we have a long way to go to realize its potential. 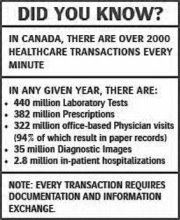 Canada’s health care system still manages information with old technologies and practices, some of which literally originated in the 19th century (94% of physician visits in Canada involve paper records; most prescriptions are handwritten). The production of information has grown exponentially, but the capacity to process, analyze, and deploy it to good effect has not kept pace. We have been, by international standards, cautious in our approach and limited in our ambition. As the title of the conference implies, our intentions are good. The challenge is moving beyond good intentions to pan-Canadian implementation. The task of building an information network that patients, providers, managers, and policy-makers can use to improve decision-making at all levels is daunting. The health information agenda competes with innumerable other claims on resources. The payoff from investments in health information may be years away, while waiting lists are on the front page of today’s newspaper. Neither the public nor providers put better health information and tools high on top of their priority lists. Nor is implementation risk-free: Perfection is unattainable, cost estimates are notoriously unstable, and failures are inevitable. On the surface then, there are many reasons to adopt a wait-and-see attitude and proceed incrementally. Yet the evidence is increasingly clear that the health care system is not as safe as we once thought it to be, is less efficient than we should expect and less evidence-based than should be acceptable. It is implausible to anticipate major improvements on these dimensions in the absence of electronic health information at various levels. Most health information conferences are held by, and for, those who have already embraced the eHealth revolution and are immersed in the technical details. The challenge is not to convince the enthusiasts – the many champions and early adopters who have promoted the cause of an EHR as an essential part of contemporary practice. It is to enlist the support of senior-level decision-makers who set overall policy and hold the purse strings, and for whom the EHR is not necessarily a top-of mind issue. Canada Health Infoway and the Health Council of Canada recognized that securing an EHR for every Canadian depends on persuading top-level decision-makers of its importance and providing them with a realistic account of what it will take to put it in place. These realities created a need for a conference pitched at just the right level for senior decision makers --- including Ministers and Deputy Ministers of Health and Finance, CEOs and VPs of regional health authorities and major organizations, and senior health information executives. These leaders, it was assumed, would want the unvarnished truth about what an EHR could accomplish the challenges of implementation and the experiences of various jurisdictions. They would want the opportunity to ask tough questions. Above all, they would want to know whether and how the EHR would help the recipients and providers of care. Canada Health Infoway’s mandate is to provide a fully interoperable EHR for 50% of Canadians by 2009. The Health Council of Canada has called for 100% coverage by 2010. Newfoundland anticipates a fully functional, province-wide EHR by 2009. The Premier of Alberta has promised an EHR for every Albertan by 2008. Based on performance to date, these are enormously ambitious and, perhaps, unachievable goals. But the sense of urgency has been upgraded; in the words of one presenter, that urgency has to be spread beyond the converted to a wider constituency. The sponsoring agencies spent a year planning the conference. The first hurdle was to attract the decision-makers; in this, the conference succeeded. The second was to assemble an international caliber program that would inspire the audience to stay through an intensive day and a half, and to engage with presenters and each other. They stayed, and they engaged. The third was to create a forum for frank and open dialogue. This we achieved by having all parties involved in all sessions, and promising to create a record of the proceedings that focused on substance and meaningful exchanges rather than on who said what in what context. o How does the EHR improve quality, efficiency, and overall patient care? 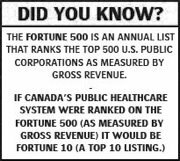 o What scale of investment is needed to make the EHR a reality for all Canadians? o What are the implementation challenges, and what strategies have proven most successful? o Improved communication between providers, and between providers and patients. In Denmark and New Zealand in particular, the flow of information has grown exponentially. o In New Zealand and England, the implementation of the EHR among various professions has created momentum for working in teams. The EHR has been a catalyst for accelerating this key element of health care innovation widely supported at the policy level throughout the world. o Patient empowerment. In Denmark, people have access to their EHR. They can review information such as laboratory results and prescriptions to improve self-care – particularly important for chronic disease management. They can see which providers have viewed their records, which allows them to monitor privacy. o Improved adherence to preventive measures. The literature suggests that electronically generated reminders for screening and follow-up increases adherence by 10% to 15%. o Improved delivery of recommended care for various conditions. The Vanguard group in Boston delivered recommended care about 60% of the time in a baseline study. This improved to over 90% by combining team-based practice with the EHR. o Nation-wide implementation of the EHR in the US, including e-prescribing with decision support tools built in, could reduce adverse drug events by two million annually, preventing 190,000 hospitalizations. o According to the literature, introducing the EHR into the ICU reduces ICU mortality by 46% to 68%; complications by 44% to 50%; and overall hospital mortality by 30% to 33%. o The use of e-prescribing in Denmark has reduced the medication problem rate from 33% to 14%, and laboratory systems have reduced tube labeling errors from 18% to 2%. o Dr. Alan Ausford, an Edmonton physician and champion of the EHR, illustrated how on a typical day, e-health improves care and changes management of up to 20% of his patients in many ways, from ensuring medications are appropriate to respecting their end-of-life treatment choices. o A major touted benefit of the EHR is chronic disease management (CDM). Some believe the benefits have already been demonstrated and there is consensus that the EHR is a necessary, but perhaps not sufficient, tool to improve CDM. o There are some risks inherent in poorly adopted EHR technology. If decision support tools interrupt providers too frequently, the flow of care can be disrupted. Implementing systems too rapidly without attention to detail can cause unintended delays in the early stages of the transition. It is notoriously difficult to produce valid international comparisons of the amount of money invested in e-health in general, and the development of the EHR in particular. The IT infrastructure has many components, including fibre-optics and satellite networks, centralized and distributed servers, other hardware, software, upgrading and maintenance, technical support, etc. Some costs are fixed, others are variable. Both formal and informal training costs are difficult to estimate. Many costs are shared, or borne by end users and not computed in jurisdiction totals. The most comprehensive and transparent data are likely those from England. The total investment since 2002 is an estimated $11.5 billion US; projected 10 year costs are $22.7 billion. Other major industries spend about 4% to 5% or more on information system development and support; the current estimated level in Canada is about 1.5%. o The Booz Allen Hamilton study in Canada estimated savings of $6 billion annually with a fully developed EHR, which would cost about $1 billion a year for 10 years to implement. o There are US estimates of $3 in benefits for every $1 spent on e-health in primary care. o Nationwide these savings could translate to $44 billion annually. o The Ontario Telehealth Network saved $5.2 million in travel grants alone in 2005-06, with 20 million kilometers of travel avoided. o In Edmonton, the use of the telephone and fax for exchanging laboratory and other information plummeted as use of the computerized portals increased. In Denmark, the information systems have saved 50 minutes a day per family doctor, and reduced telephone contact between doctors and hospitals by 66%. o 47% reduction in long term care admissions. o New Zealand anticipates fewer referrals to specialists because of better communications, with better capacity to control costs. Implementation is at varying stages around the world. At the national level, New Zealand and Denmark appear to have the greatest penetration, with 80% and more of family doctors using an EHR in their practices. The office-centred record is, again to varying degrees, linkable to external systems such as laboratory, imaging, and drugs. In Denmark, at least one county boasts 100% electronic access to hospital discharge letters; referrals to specialists; lab results; billings; prescribing; home care; and pharmacies. o The transition period is invariably difficult. The initial preferences of users (e.g., text-based rather than structured data entry) may change over time. Flexibility is therefore essential. o Moving to an EHR in its fullest form is not just a technical innovation; it is a cultural transformation. Change management is vital, and failure to build in processes for effecting the transformation will reduce both uptake and impact. In the words of one presenter, all of us – providers and managers in particular – need to complete the transition from resistance to electronic information (historical position) to acceptance (current position) to addiction (cannot function without it). o Implementation takes time, but can be accelerated once adoption and proven successes have reached a critical mass, or tipping point. At these stages, policy can drive faster change, for example, by making certain resources available only through electronic portals. o The data elements are the core of any system, and spending time and resources on standardizing definitions and usage will go a long way toward creating information systems that yield valid and reliable measures of quality and performance. o There will be far greater acceptance of provider-level IT if workflow is modified accordingly to gain improvements. o Creating secure networks for communicating information in any form has proven to be hugely appealing to providers in almost every country. E-mail use grows very rapidly and is an effective vehicle for introducing providers to the world of electronic information. o It is very important to structure contracts so that risks are appropriately shared, and purchasers do not pay for systems that do not work. The National Health Service in Britain (NHS) has taken a firm stance, and although it incurred delays because it changed a principal vendor, it did not take a huge financial hit. o Leadership at all levels is crucial. Clinician leadership is essential but cannot be effective in isolation. There must be commitment from Boards and CEOs, the government, and the various sectors. o Helping family doctors use the data generated by the EHR to analyze and improve their own practices will increase uptake. In Denmark, the counties fund data consultants who visit each practice one to two times each year to troubleshoot and help produce usable quality oriented information on treatment patterns, etc. o If providers perceive “early wins” in the process, they will be more likely to invest their own money and agree to standards. o Some strategies to enhance adoption among providers include clinical stories, peer-to-peer training, demonstration clinics, mentorship, and protected time. o Giving patient’s access to their EHR is the wave of the future. Experience to date in Denmark and the US has been uniformly positive. If the patient is to be at the centre of the system, the patient has to be included in the information network and given the capacity to contribute to and use the EHR, and to communicate with the care team. 5. Improved efficiency and better value for money. Both implicitly and explicitly, the conference addressed all of these priorities and provided evidence and observations on how the EHR could contribute to addressing them. The following table applies the themes more directly to the Canadian context – a consolidation of what we know (with varying degrees of certainty) about the potential of full-fledged implementation. As the EHR becomes richer, with more elements and connectivity, the potential impact grows. In some areas, there is already solid evidence that the benefits can be realized. In others, the logical case appears persuasive, but there is a need for stronger empirical evidence. The EHR by itself cannot guarantee improved performance. The culture must also change, and all health system stakeholders, including users of services, must be inclined and trained to convert the potential of health information into concrete improvements in quality and efficiency. The benefits of the EHR grow over time as providers in particular exploit its potential to enhance communications, improve safety and quality by using decision support tools, expand the network of trusted colleagues, and generate valid performance measures and comparisons. In other words, however indifferent the initial reaction and despite the inevitable pain of the transition phase, over time the human and capital investment generates a high rate of return. No one ever goes back to the pre-EHR world once exposed.